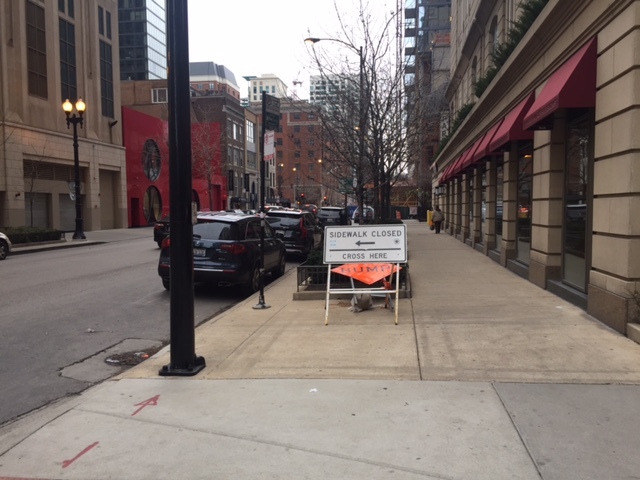 Earlier this month Streetsblog reader Anna Weaver was walking with a friend on the sidewalk on the north side of Huron between Wabash and State in River North when their path was blocked by a construction zone for a large development. 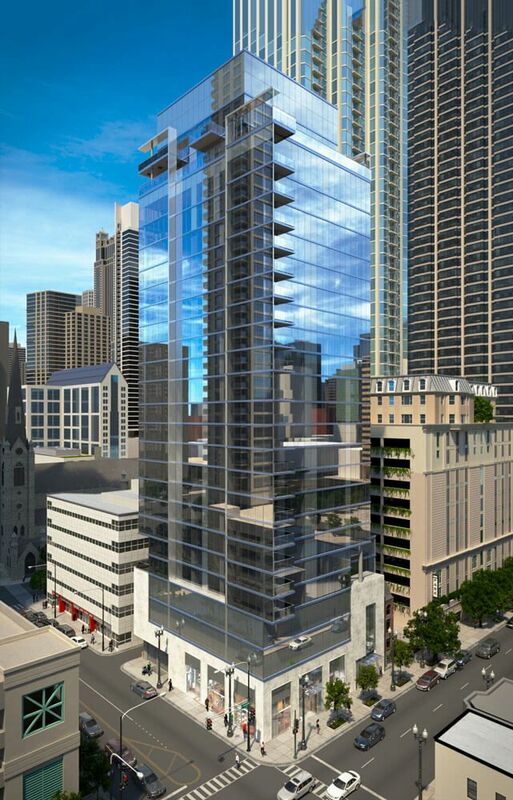 The project is a 26-story, high-end transit-oriented development, featuring 102 rental units and 31 parking spaces, located a short walk south of the Chicago Red Line station. It’s being developed by CA Ventures and was designed by the architecture firm Valerio Dewalt Train Associates. Rendering of the under-construction TOD. The sidewalk was fenced off, and about half the width of the Huron roadway was blocked. There were no signs warning about the sidewalk closure, so the situation forced pedestrians to cross to the south side of Huron in the middle of the block. The blockage of sidewalks and bike lanes by construction projects is a common problem in our city, and often the problem doesn’t get addressed unless a citizen (or Streetsblog) gives a heads-up the Chicago Department of Transportation. In fairness, once CDOT is aware of the issue, they generally move quickly to address it. To their credit, once notified, CDOT took immediate action. A department official told Weaver that the construction company, Clark Construction, was supposed to provide a barrier-protected walkway for pedestrians, but instead they pushed their construction fence against the Jersey wall barrier and made no pedestrian accommodation. Weaver was told an inspector had ticketed Clark and was going on site that day to make sure the company moved their fence back and provided ramps at ends of walkway. The official said the contractor would be ticketed each day until they came into compliance with the requirement to provide the walkway. Two days after Weaver contacted CDOT, Clark had placed a “Sidewalk Closed, Cross Here” sign directing pedestrians to cross at Wabash. However, the blockade was still in place, with no other pedestrian accommodations. When Weaver dropped by this afternoon, a week after she originally contacted CDOT, Clark had provided a protected walkway on State, but there was still no walkway on Huron, just the sign directing pedestrians to cross the street. Presumably, the contractor has continued to get tickets for noncompliance, but they’re still violating the rules and inconveniencing people on foot. CDOT had the day off for Lincoln’s Birthday today, but I’ll update this post if we hear from them tomorrow on this issue. I walked through here the other weekend (not a lot of traffic pedestrian or vehicle) and thought it was dangerous. FYI, This is happening on Grand in a couple of places as well — 853 W Grand (where the ‘sidewalk closed’ signs are posted after you crest the bride so there’s nowhere to cross) and 706 W Grand. Its was like that all summer long, I know because I was doing a parking study and walked by there daily. On top of that there were many times a big rig taking up an additional lane on Huron delivering supplies making the the roadway even more hazardous for pedestrians and bikers. I know it’s far off your radar, but 6500 S Cicero has the same problem. Lou Malnati’s restaurant being built on a busy intersection that has closed the sidewalk on both sides of the corner. No pedestrian accommodations made. Frequently pedestrians are in the turning lane. And there are frequent pedestrians there from the hotels across the street. Quite dangerous. The recently constructed Panera kitty corner had the same problem, but they managed their construction very quickly, so it only happened for a few days. Malnati’s is going on months. Actually, we’ve got a reporter and a freelancer who work and live on the Southwest Side, but please send some photos if you get a chance. That’s a VERY dangerous location to have a sidewalk closure with no pedestrian accommodations. Please do share some photos and name the construction company. And today they had a truck parked in the turning lane. So people are forced to walk in the main lane, even while drivers jockey for position.